Every year on February 14, over 110 million Valentine's Day roses and 1 billion cards are exchanged around the globe. There’s something comforting about this tradition; no matter what’s going on in the world, we can all take this one day of the year to celebrate the people we love. 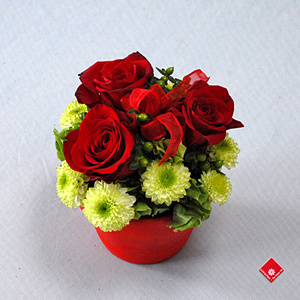 At The Flower Pot, we believe that there is the perfect Valentine's gift for everyone and that each one should be as unique as its recipient. That’s why we offer romantic gifts for any budget, ranging from $15 to $210, with a free Valentine's Day card including your custom message. Just in time for February 14 is our newest rose arrangement, 3 Roses in Terracotta. It’s one of our most affordable Valentine's gifts, and includes three fresh roses and Santini pompons in a decorative pot. We’ll deliver your gift to any home or office in the Montreal area – it’s our way of playing cupid on this most romantic day of the year. I also believe that there is the perfect Valentine's gift for everyone and that each one should be as unique as its recipient.I agree, keep up the good work.